"Our society is a bit unicorn obsessed at the moment. But have you ever stopped and wondered what unicorns themselves love? This book contains a unicorn’s favorite recipes, beauty tips, favorite things, and more. What we’re saying is the unicorn-obsessed person in your life NEEDS it." "Cleanse that palate—and your brain—while Jessie Oleson Moore drops some unicorn knowledge on you. Enough sly humor to keep you turning through pages of basic facts, recipes, and “unicorn-y jokes.” Stuff Unicorns Love is a comprehensive unicorn encyclopedia. If you want to attract unicorns or embrace the unicorn mindset in your own life, this book has the answers. Oleson Moore is a talent, who pulls off a pretty great feat with this one: engaging both a third-grader who loves glitter and tired 44-year-old who does not." "This delightfully fun read is perfect for younger readers as well as anyone who is young at heart, and wants to enjoy a bit of whimsy in their day. 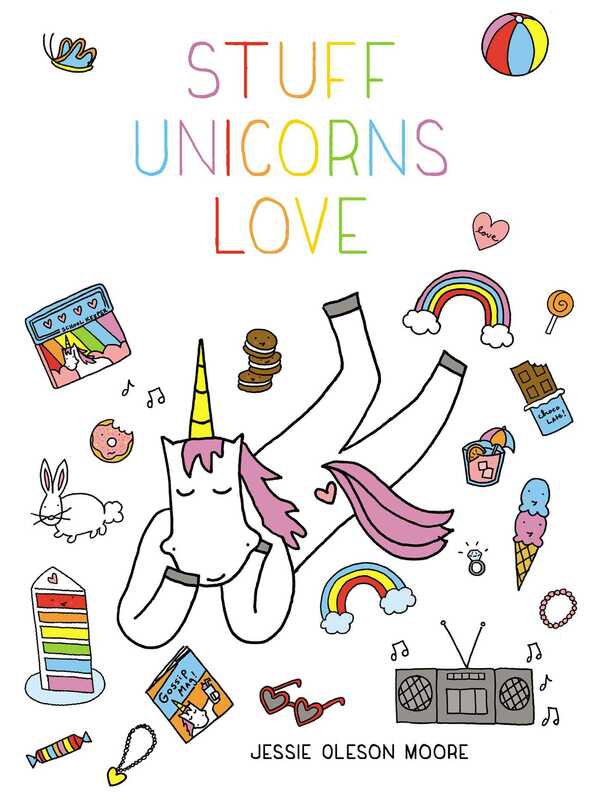 Stuff Unicorns Love is an adorable read that shares fun fictional facts about unicorns that will make you smile alongside perfect illustrations. The perfect way to add a bit of fun to your day. I can’t recommend it enough to anyone looking for a perfectly cute read." "This comprehensive look at a wide range of things that interest unicorns is filled with everything tweens love--cartoon illustrations, bright colors, and lots of rainbows. A great handbook for friends to pore over on a rainy day and use to inform their own illustrations. A light hearted and entertaining romp through all the sugary sweet sparkly goodness that makes unicorns ‘tick.’ Unicorn hoodie optional while reading this, but highly encouraged!" "Even as an adult, I loved this book!"